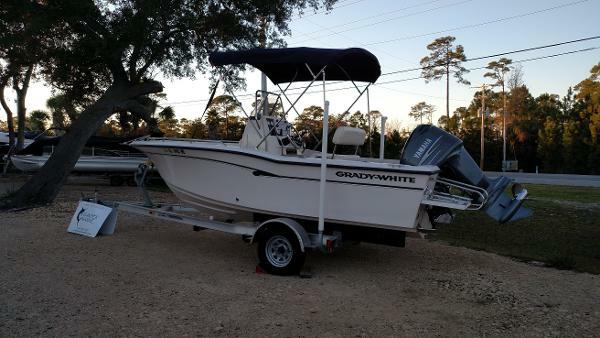 2010 Grady-White 180 Sportsman, 2010 Grady-White Sportsman 180, center console. Extremely clean and well maintained. 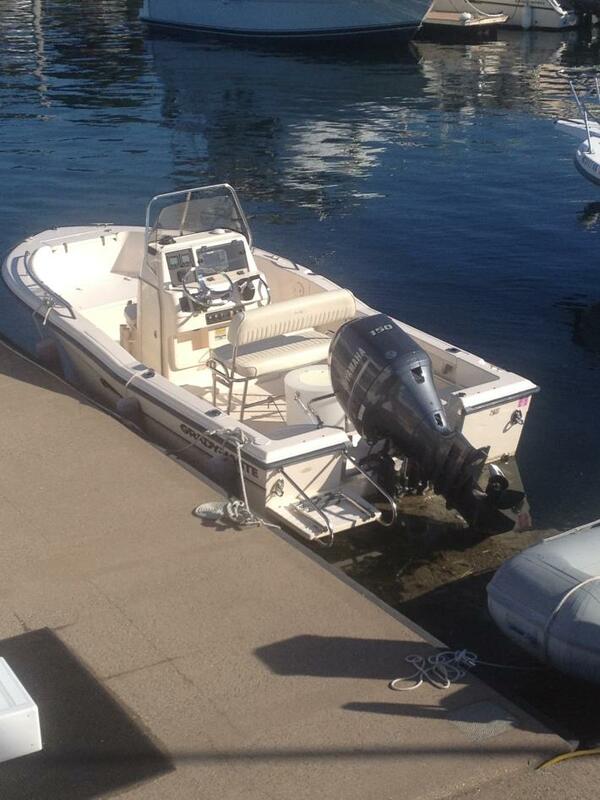 2nd owner, locally sold new at Anchor Marine traded in and sold to me . Yamaha 150 4 stroke. Deep V "SeaV2 bottom, for very smooth, bigger boat ride. . 176 hours. 11 Gallon insulated ice box/ live well, aerated/ under seat cooler. Flushed after every use. professionally washed once a week and waxed once a month. All cushions washed and stood inside. There is absolutely nothing wrong with this boat. Best 18 footer on the water. Cruises effortlessly at 31 mph . Best cruise 26 mph @5 GPH . Top speed 43 with bottom paint. Fresh water wash down/shower and 10 gallon tank. Raw water wash down. Four stainless steel trolling holders. Rod storage. Hydraulic steering. Trim tabs with indicator. Dual battery's w/ switch. Garmin 740 GPS. 12 volt outlet. Tall bow rail. Ski pylon. Swim platform with ladder. Reversible multi position bench seat with cooler storage space underneath. All cushions in prefect condition. There is no bimini, otherwise this boat is loaded. Very seaworthy. No trailer. Super clean. Priced according to excellent condition NADA. In water $26,900 OBO. 2000 Grady White 180 Sportsman Center Console One of the premiere builders center consoles and fishing boats, Grady White takes very seriously the quality in their "Sportsman" series knowing that Grady owners usually move up in size.For the family that would like to cruise they will enjoy the full cushion package including aft seating, seating in the front as well as the bow sun pad. 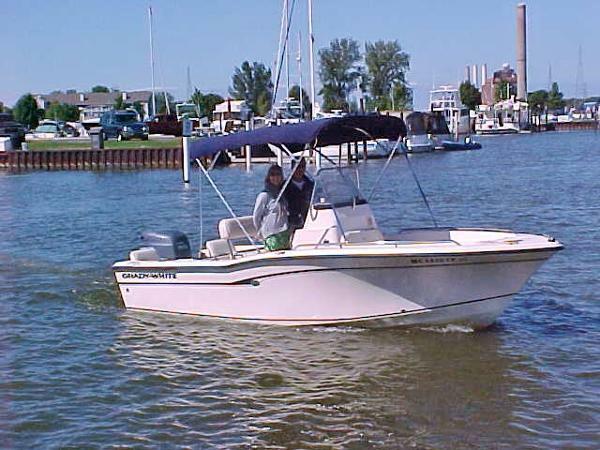 For the Angler there is a large insulated fish box, livewell, rod holders, rod storage, and a raised casting platform. 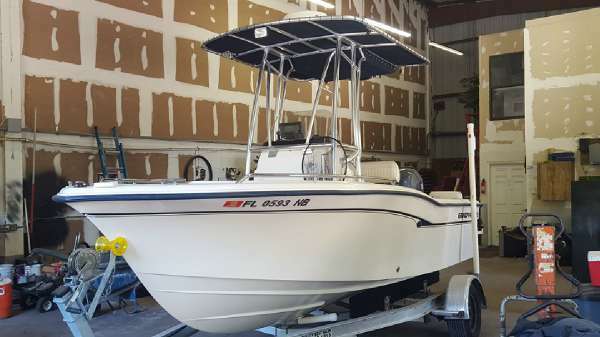 She is outfitted with the ultra-dependable Honda 130 4-Stroke.Hightlights include bimini, self-draining cockpit, auto and manual bilge pump, dual battery with switch, swim platform, swim ladder, livewell, storage, full cushion package.OWNERS REMARKS: This boat was moved to Florida in 2006 and was put in high and dry storage at a marina. 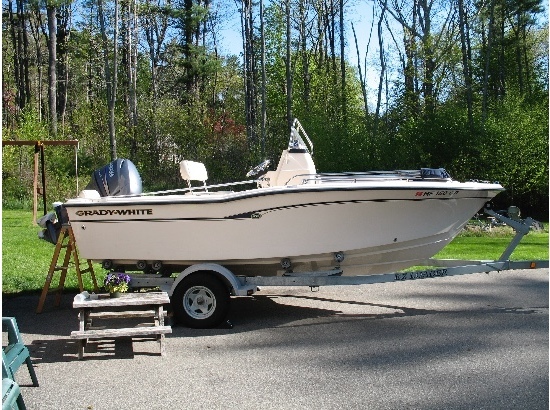 The boat was used once until late in 2015 it was sold to it's second owner. 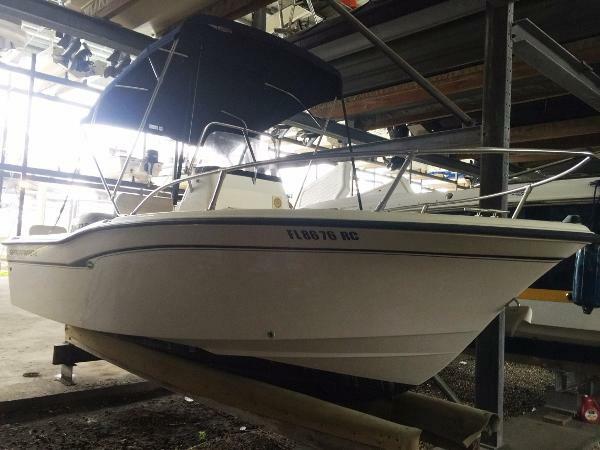 The second owner did all due-diligence to put the boat back in service and used it frequently the past year before trading it in.LOA 18' Beam 8' Draft 15" Weight 2150 lbs w/out engine, Engine Honda 130 4-Stroke Hours N/A Fuel 54gal The Company offers the details of this vessel in good faith, cannot guarantee or warrant the accuracy of this information nor warrant the condition of the vessel. Buyer should instruct his agents or surveyors, to investigate such details as the buyer desires validated. Subject to prior sale, price change, or withdrawal without notice. 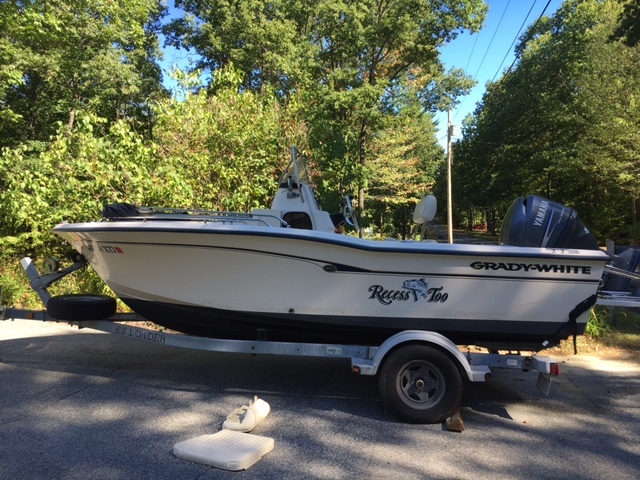 2002 Grady-White 180 Sportsman CC 2002 Grady White 2002 180 CC Sportsman with a Yamaha 150 hpdi (only 234 hrs) This boat is in exceptional condition and comes with a 2012 aluminum trailer that is also in excellent condition. She has been kept indoors and it shows. 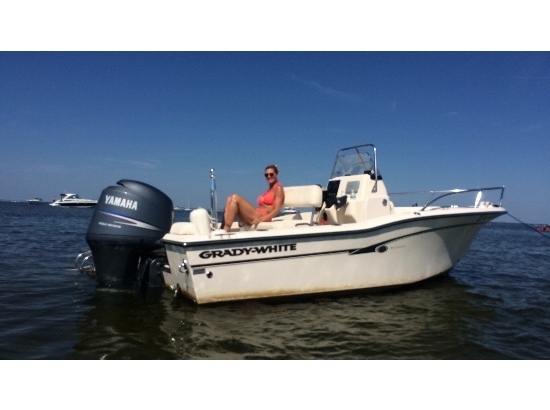 The quality, safety, ride and durability of Grady-White in an easy size, truly high condition and affordable price. All the GRADY standards like SeaV2 hull design, quality hardware and gel coat, rod holders, self-bailing, foam flotation, all compartments drain overboard by gravity. Cockpit depth of 22", cockpit square footage of 48 sq. ft., extensive storage and insulated boxes, and much more standard features.